Whether you're interviewing for a job, giving a sales pitch, or meeting an industry contact, first impressions really do matter. The direction of your professional relationship with a person — and in some cases, your career — can depend heavily upon what that person thinks of you upon your first meeting, and bad impressions are difficult to undo. In sales especially, your initial interaction with a potential client can make the difference between closing a lucrative deal and permanently losing new business. Larry Caretsky, president of customer relationship management software provider Commence, believes that the secret to good first impressions is having top-notch relationship-building skills. "At its core, sales is all about building and managing relationships," Caretsky told Business News Daily. "A sales professional who is outgoing and personable may have a natural edge, but it's also possible for people without that innate ability to hone their relationship management skills." Dress for success and project confidence. Before someone hears a word you say, he or she registers an impression of you based on your appearance. Make sure you look professional and well groomed, like someone the person would want to hire or do business with. Project a successful image, and you're more likely to become successful. Confidence is also key: If you seem confident, people will assume you have reason to be. 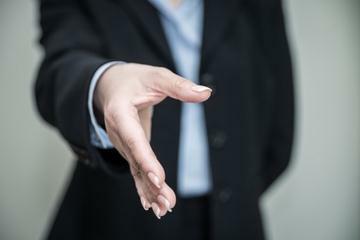 Establish rapport with a smile, handshake and body language. When you give someone a warm, genuine smile, you're sending the message that you are friendly and approachable. A firm handshake accompanied by eye contact also makes a positive impression and helps to build trust. When conversing with interviewers or potential customers, respect their space, but lean in slightly to signal that you are interested in what they are saying. Keep the pace of your conversation unhurried. Many salespeople mistakenly think that since they may only have a few moments to deliver their pitch, they have to speak rapidly, cramming as many words as possible into each minute. This gave rise to the expression "fast-talking salesperson," which almost never has a positive connotation. People who encounter a salesperson who speaks rapidly will develop a sense of mistrust, so speak slowly and articulately. The same applies to a job interview: Running through your qualifications or answering questions too quickly may convey nervousness or unease.